Deep-pocketed and technologically savvy though it may be, the fracking industry faces serious public relations hurdles, not the least of which may be Hollywood. Several recent films depict fracking as a surefire way to poison or deplete a rural American community’s water supply. These movies boast facts and evidence that appeal to the viewer’s critical thinking, but like many motion pictures, they also offer an emotional punch to the gut. The 2010 documentary "Gasland," written and directed by Pennsylvania native Josh Fox, focuses on communities around the country that have been impacted by fracking. "Gasland" was nominated for an Academy Award for Best Documentary in 2011. 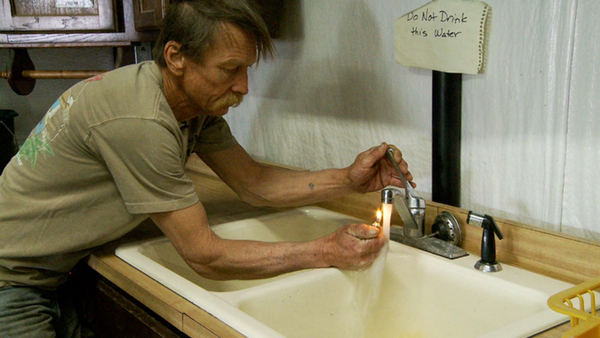 The film’s most memorable scene features Weld County, Colo., landowner Mike Markham igniting gas from a well water faucet in his home with a cigarette lighter, which Fox attributes to natural gas exploration in the area. The director features other residents who have experienced chronic health problems allegedly traceable to contamination of their air, their water wells or surface water. The Independent Petroleum Association of America (IPAA) counterattacked by launching Energy in Depth, a webpage with a list of claimed factual inaccuracies in the documentary. IPAA also produced a film titled "Truthland," which sought to discredit Gasland and reassure viewers about the safety of natural gas fracking. Last year’s feature film "Promised Land" features Matt Damon as a natural gas landman, a salesman who goes to a Pennsylvania town and talks farmers into allowing drilling on their property in exchange for money. Though the Hollywood star has said in interviews the film is ideology-free and “not meant to give you any answers. It’s actually just meant to catalyze some conversations and reflection,” a plot twist at the end confirms the corporate villain. John Krasinski, who co-wrote the screenplay and stars in "Promised Land," said the film’s original premise actually involved wind power, but that recent news coverage prompted fracking to replace wind power as a more relevant backdrop. Despite its star power, "Promised Land" didn’t garner the accolades that "Gasland" did. Nevertheless, Politico said that "Promised Land" reflected a growing trend in the film industry, started by "Gasland," about the perils of fracking. Fracking, when viewed on a Hollywood screen, will leave not a taste of buttery popcorn but a sour taste of methane in your mouth. The New York Times published an article in which they investigated all of the claims in "Gasland". They found a lot of misinformation and extremely skewed facts to enhance the impact of the movie.